Hi, and happy little Friday. I'm still in full transformation mode in my household. There are some seriously exciting things on the near horizon. I've said it many times before that one's bedroom is an oasis that should be calming and restorative. I haven't seemed to be able to get mine just right until now. Everything has come together perfectly and I'm loving the results. Here's a little peek. 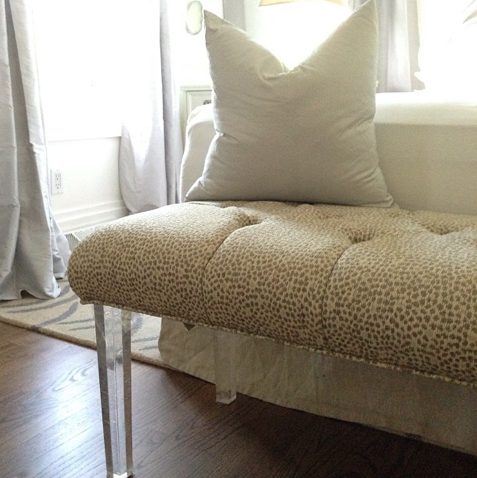 Love the lucite legs on this bench and the soft leopard inspired print. Sometimes you get lucky at homesense when you pop in to buy bedding. The basket in the image above was a homesense find too. The September issue of Style At Home, that we're in, is out on shelves now. I may or may not have bought an obscene amount of them. Haha. Go get one. I'm in the very best company in that one. Style at Home's Editor, Erin McLaughlin shares her bedroom and it's positively gorgeous dreamy. Christine Dovey of Bijou and Boheme shares sweet little Jasper's nursery. I can't gush enough about how awesome it is. I was also quite taken with Mariana D'Amici's place. Layers on layers of whites and neutrals. Well I'm off to take care of the next project. PS- My international friends, you can buy a Style At Home digital subscription for your iPad and get all of the september goodness I spoke of above. Go here to check it out. I adore your room! It's perfect. Also, I need to go and buy Style at Home. I fear that my renewal didn't happen in time and that's why it hasn't arrived yet. I'm dying to see it! I'm excited for you...can't wait to see what else you're up to! I thought the issue was just gorgeous! There's a lot of white in it, which made me extra happy, but the spaces featured were all quite beautiful. The stories shared were inspiring. Way to go Style at Home! And - yes - your house is gorgeous Erica! So so inviting! Love love love that bench!!!! BIG TIME! Have a great weekend my love. Have a lovely weekend with your fam Erica! I absolutely love that bench. So gorgeous! You have such consistently good taste. I was wondering how to get my Texas hands on that magazine. Thanks for the tip! it's looking peaceful and exciting!! I love your room! there's just so much light coming from window installation and that animal printed bench is amazing! Hi! 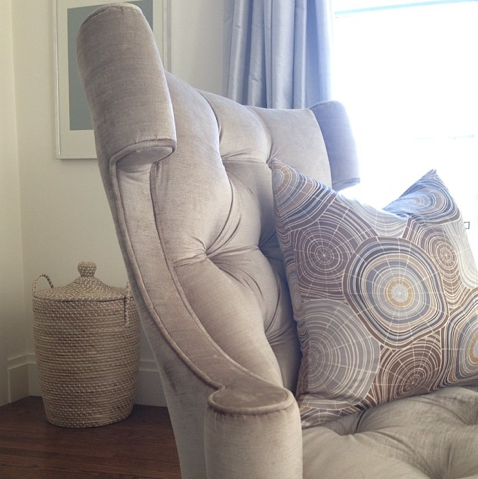 I love the fabric lounge chairs you included in your bedroom design! The patterns and textures of the fabric look too cute! Love your blog, thanks for posting!